FLASH BACK: The first trio Black Bush Polder triple murder accused. A 63-year-old farmer was charged with being an accessory in the Black Bush Polder triple murder. According to the facts read at the Georgetown Magistrates Court One, the prosecution states that on July 22, 2016 and on days following Chaitram (one name only) called ‘Cashew’ received, relieved, comforted and assisted Jairam ‘Ryan’ Chaitram , Tameshwar ‘Guana’ Jagmohan, Carlton ‘Rishi’ or ‘Lima’ Chaitram and Rakesh ‘Rocky’ Kurramchand knowing full well that the quartet had committed murder. The matter continues at the Mibicuri Magistrates Court on October 18, 2016. 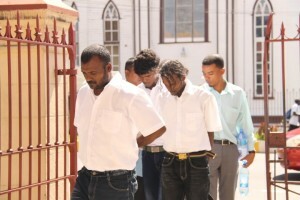 Police investigators said they found out that Chaitram provided his licensed shotgun to those accused of the murder of Pawan Chandradeo, Jaikarran Chandradeo, and Naresh Rooplall at Cookrite Savannah, Black Bush Polder. The arraignment of Chaitram on a charge of accessory to the murder followed last Thursday’s (September 22, 2016) charging of 40-year-old Rakesh Kurramchand, of Sheet Anchor Road, Corentyne with murder of the trio.